It had all the makings of a frustrating Friday night at Agganis Arena for the No. 2/3 Boston University men’s hockey team. Over the first 40 minutes of play, the Terriers (19-4-4, 13-2-2 Hockey East) twice built up a two–goal advantage over the University of New Hampshire, and twice saw the Wildcats (10-16-2, 5-10-1 Hockey East) sheer down their deficit. What remained of a Terrier lead quickly unraveled by way of a power-play strike off the stick of UNH captain Matt Willows, who equalized the score at three goals apiece with just over 12 minutes remaining in the second. Rather than panic, the Terriers went back to square one. Capitalize they did. Three unanswered goals later, the Terriers skated off the Agganis Arena ice with a 6-3 victory over UNH in tow. The victory now extends the Terriers’ win streak to seven games — the team’s first since the end of its 2008-09 NCAA championship campaign. 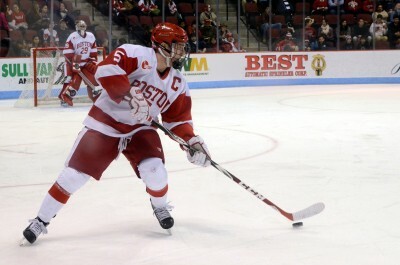 BU boasted a varied attack against the Wildcats with five skaters lighting the lamp for the scarlet and white. Leading the way for the Terriers was senior assistant captain Cason Hohmann, who notched his first multi-goal game since Oct. 26, 2012. Just as it did in its last match against the University of Massachusetts Lowell on Feb. 6, BU was able to get on the board with less than a minute eclipsed on the clock. Sophomore center Robbie Baillargeon corralled the puck off of a faceoff and sent it to Hohmann, who one-timed it past UNH goaltender Danny Tirone just 42 seconds in to hand BU a 1-0 lead. Hohmann bested Tirone again at 7:06 in the first, forcing a rebound offering into the UNH cage to build a two-goal cushion for BU. BU could not close out the first period without a blemish, however, as UNH forward Dan Correale fired a ricocheted puck past BU junior goaltender Matt O’Connor at 14:14 to bring the Wildcats within one at the end of the opening stanza. Freshman center Jack Eichel’s 16th tally on the year at 4:14 in the second was negated just 33 seconds later courtesy of a goal from UNH freshman Warren Foegele — with Willows following suit with his own score a little under three minutes later. Both teams traded prime scoring chances as the second period winded down. Finally, BU’s conference-leading extra-man unit came through when given its first opportunity on the night. Just 13 seconds after Wildcat forward Andrew Poturalski was whistled for interference, junior captain Matt Grzelcyk unleashed a shot from the point that bounced past Tirone with 2:50 left on the clock to push BU out in front, 4-3. BU’s blueliners found their scoring touch again at 1:57 in the third, with freshman defenseman Brandon Hickey’s snipe from beyond the right circle putting the Terriers up for good. The Terriers capped their win thanks to junior forward Ahti Oksanen’s team-leading 19th goal off the year of an empty-net chance with 1:10 remaining. O’Connor remained poised in net during the final period, securing nine saves — and 30 total in the game — to earn his 16th win of the season. Seeing multi-goal leads evaporate twice in one game was cause for some frustration on Quinn’s account, but the Terrier coach also doled out high remarks for his team’s tenacity in fighting back and earning two points against a Hockey East foe. “The reason I think we have the record we have is we have some talent, but I think we have a grit element to our game, for the most part, all year,” Quinn said. “When we struggle, I think we get away from that. I think we think we’re a little bit more like the Harlem Globetrotters and the ’86 Oilers and we can shoot ourselves in the foot because we have been successful offensively.